In all of his works, there are bright colors, picturesque subjects, [and] brilliant and interesting brushwork in the painting of architectural details, foliage, and . . . water full of reflections. 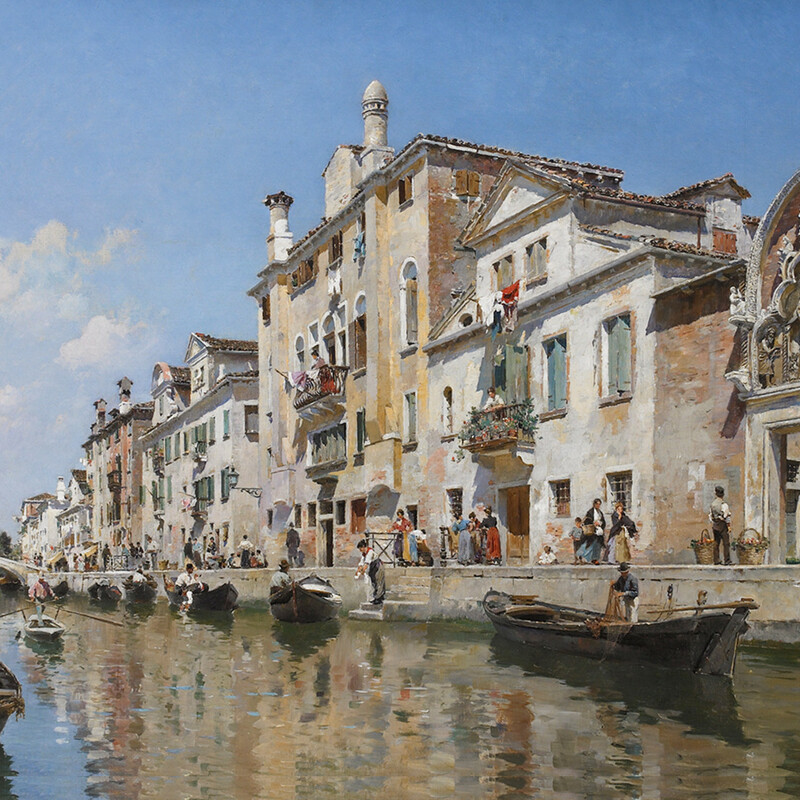 A native of Peru, Federico del Campo (1837–1923) is best known for paintings of Venice in the vedute tradition of Canaletto and Guardi that were in high demand among late 19th-century mobile tourists. After studies at a small school in his native Lima, the artist was given support to study abroad by the Peruvian diplomat, Juan Mariano de Goyeneche and Gambio. Del Campo was trained in Madrid and spent time in Paris, leaving just before the outbreak of the Franco-Prussian War. Subsequently he toured major Italian cities, but chose to remain in Venice, where he joined the expatriate community that included the painters Mariano Fortuny and Martin Rico. Del Campo often worked side by side with Rico, combining an Impressionist plein-air approach in the rendering of reflections and water with precisely executed architectural form. Del Campo’s paintings were especially popular with English art patrons, including members of the royal family. A special exhibition of his work, held in Chicago in 1893, was organized by the London dealer Arthur Tooth to coincide with the World’s Columbian Exposition. Del Campo seems to have moved to London by 1893, but he was living in Venice in 1919, according to a book published that year entitled Peruvians of To-Day.